Summer months from mid-June through mid-September. All the trails will be open during the summer season, and the weather will be at its warmest and driest. Warm up to the Canadian Rockies without even leaving the car. 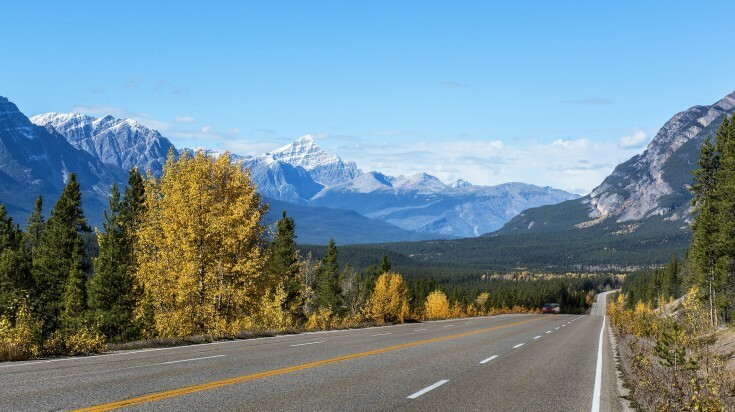 This 232 km stretch of road connects Banff and Jasper National Parks and is considered one of the most stunning drives on the planet. You’ll be pulling the car over every few miles to check out another pristine lake, a dominating glacier, a lush valley, or to get a closer look at the frolicking wildlife. Regarded as one of the best day hikes in the Canadian Rockies, the Alpine Circuit is a 12 km loop around Lake O’Hara that features stunning vistas. Graced with hanging valleys and lichen-covered rocks, this trail travels along daring cliff ledges and the shores of several glacier lakes. The views and scenery are beyond impressive. Discovered in 1883, these hot springs are the best place to soothe sore muscles and take a load off for a few hours. Soak in water naturally heated deep within the earth’s crust to 47° C (116° F) all while surrounded by the amazing natural scenery of the Rockies. Cruise through one of Canada’s most picturesque lakes via kayak or canoe. Moraine Lake might be the most scenic body of water in the whole Rockies with its twinkling turquoise waters contained by peak after jagged peak of the encompassing mountains. The highest point on the Icefield Parkway (Bow Summit) overlooks the most brilliantly colored glacier lake in the entire Canadian Rockies region. 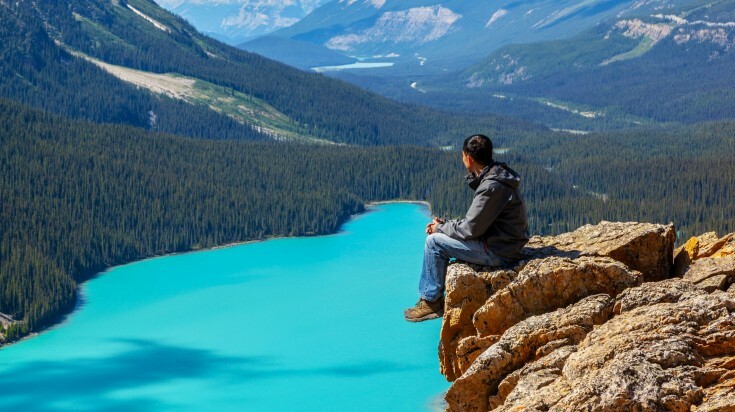 Peyto Lake, framed by a dark-green forest that transforms into bare-mountain walls, is a truly breathtaking sight. This uniquely shaped body of water (yes, like a horseshoe) in Jasper National Park is a big draw for cliff-jumping adrenaline junkies. Even if you’re not going to jump, the deep, glassy waters harnessed by steep, cliffs create an epic swimming spot in the Canadian Rockies. It’s just 1.5km from the trailhead to the lake, making it a must-stop-at spot along the Icefields Parkway. 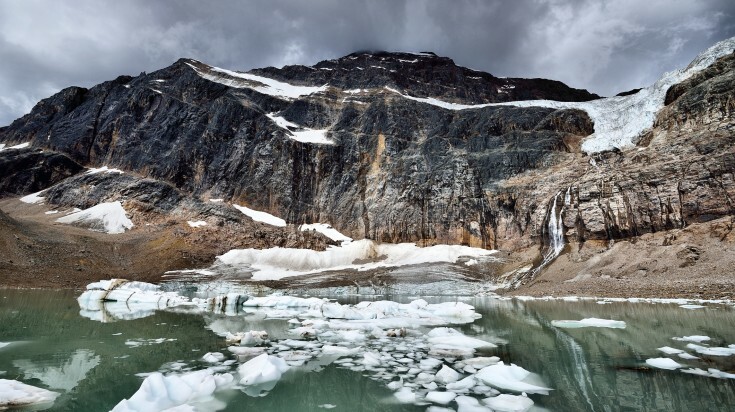 Get your glacier fix and visit the largest icefield in the entire Canadian Rockies region. This area within Jasper National Park houses six giant glaciers, and walking tours of the massive Athabasca Glacier are available daily. Test your courage on the Glacier Skywalk, a 900m high glass floor observation deck overlooking an impossibly deep gorge. This mighty flow of water located in Jasper National Park has carved away at the limestone rocks over time to create a 23m waterfall. The name means “turbulent river,” and it certainly fits the energy and intensity of the water flow. There is an upper fall and lower fall, made up of multiple cascades and a small river canyon. The footbridge is the perfect viewpoint, and there are several short trails that line the perimeter of the falls. 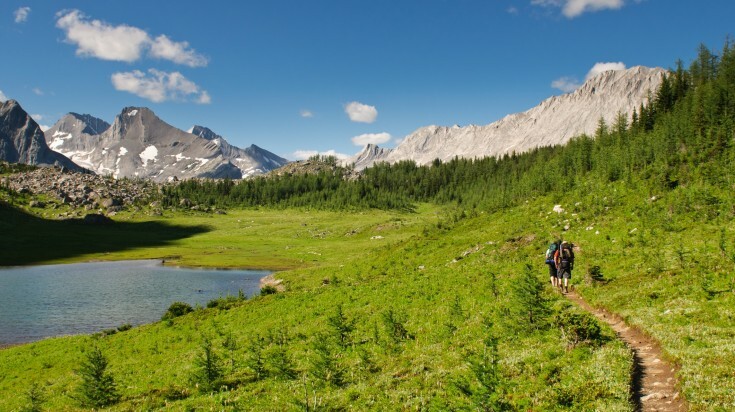 This is Yoho National Park’s premier hiking trail because trekkers will get to experience and see a little bit of everything. The 21km circuit trail is bordered by sky-high mountains and blessed with natural glaciers, valley viewpoints, and multiple waterfalls. This is a rugged, strenuous trek that is more than worth the reward. Not to mention the trail is marked by one of Canada’s highest waterfalls, Takakkaw Falls, cascading 384m. Accessible only by boat from the shores of the Rockies’ largest fed glacier lake, Maligne Lake, Spirit Island provides one of the best picture opportunities in the Canadian Rockies. 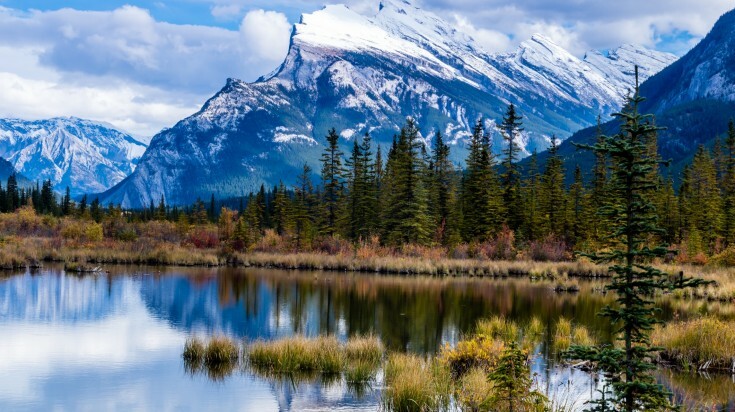 Located in Jasper National Park, a boat cruise out to this national landmark is a must-do. It’s especially magical at sunset. If you've got less than a week in the Canadian Rockies, follow this highlight-packed four-day itinerary to ensure you hit all the hot-spots. Take a short stop at the quirky and lively town of Kamloops, mid-way between Vancouver and Valemount. 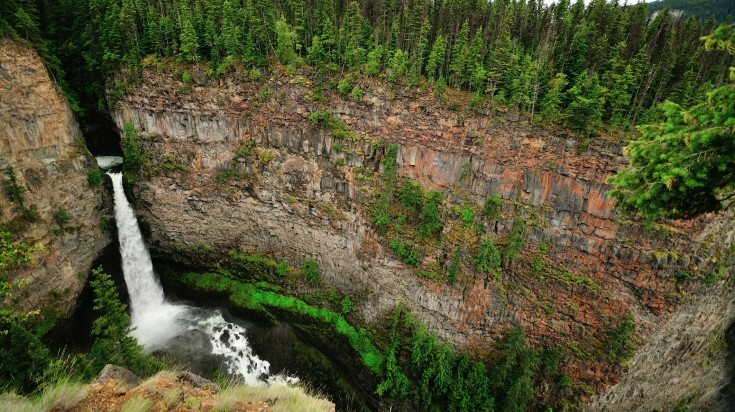 Witness Spahats Creek Waterfall, a 60m tall fall pouring from a narrow gorge with the surrounding nature of Grey Wells Provincial Park. Drivealong Icefields Parkway, considered to be one of the most scenic highways in the world. 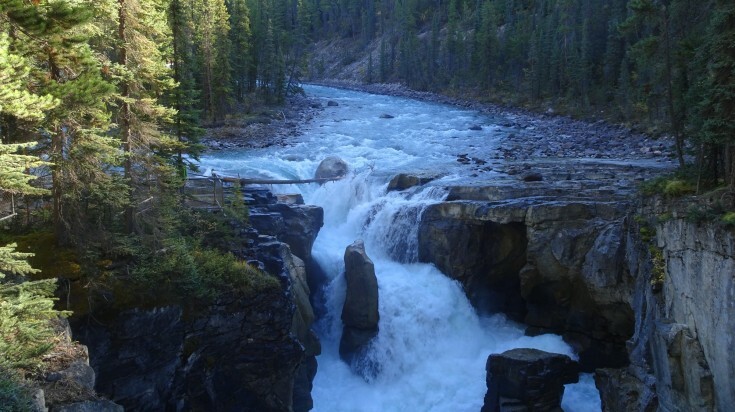 Enjoy the beautiful scene of Athabasca Falls as you pass through Jasper National Park. Marvel at the color of Peyto Lake, a glacier-fed lake further along in Banff National Park. 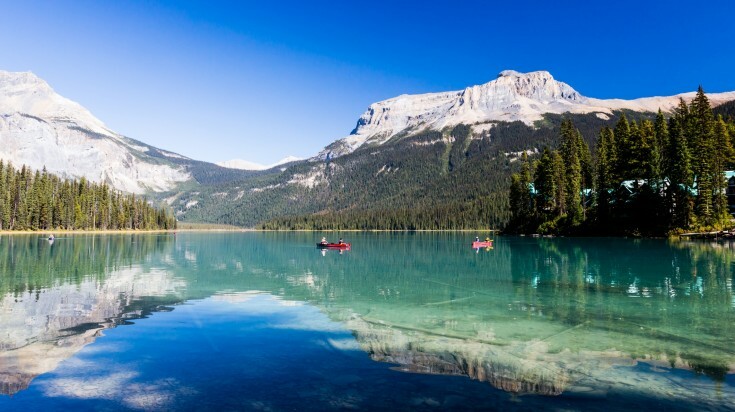 Driving the 24 km loop around Lake Minnewanka will take you past the scenic Cascades Ponds (good for picnics, light trekking, and sunbathing). Two Jack Lake (good for swimming and canoeing) and Bankhead, an old coal mining town. Continue to Lake Louise for a gondola ride up the Mount Whitehorn for dramatic views across multiple valleys and glaciers. Hit Moraine Lake at sunset for some of the most iconic photos you can take in the Canadian Rockies. 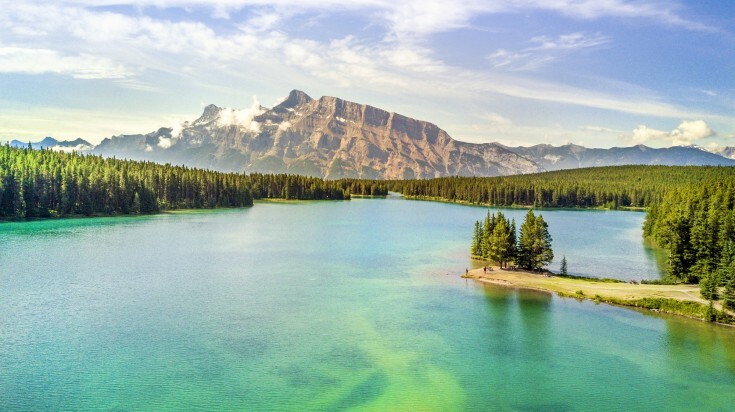 One week in the Canadian Rockies allows you to slow the pace a little bit and spend nearly half the time in two of the best National Parks - Banff and Jasper. The charming mountain town of Waterton and its historic hotel constructed in 1927. Visit Head-Smashed-In-Buffalo Jump, the UNESCO World Heritage Site and open-air museum to learn about the culture of the Blackfoot Nation and history of stampeding buffalo. 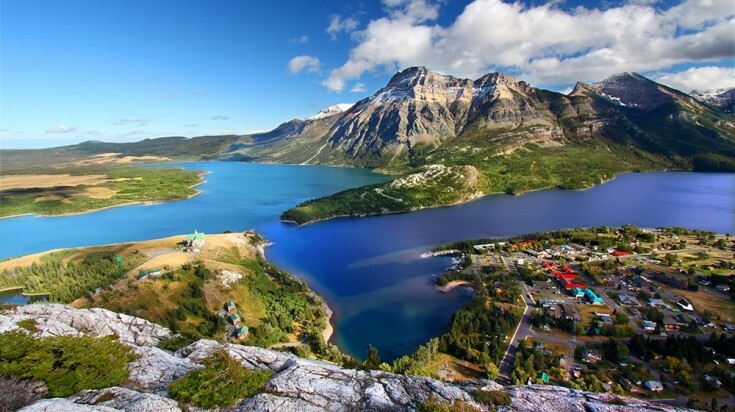 Waterton Lake National Park, the meeting point of the western prairies and Canadian Rockies. 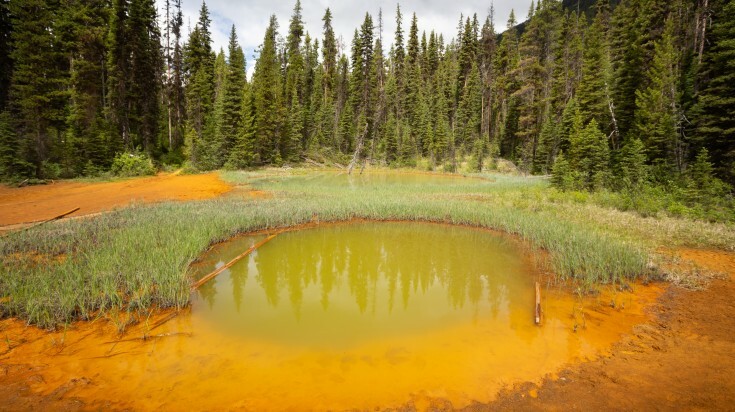 Hike the Red Rock Trail and discover other serene nature treks like Cradle Lake and Horseshoe Basin. Another must-trek is the Bertha Falls Trail, leading to the base of the magnificent falls with lots of mountainous scenery along the way. Visit the Cave and Basin National Historic Site. Explore the underground cave, soak in the bubbling thermo-mineral waters, inspect the historic architecture, and learn the story of the discovery of Canada's first national park (Banff) in 1883! 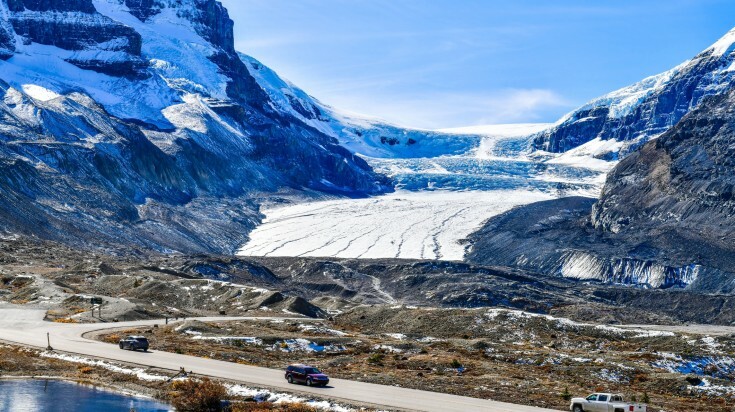 Take on the world-famous Icefield Parkways, an above and beyond scenic drive on your way to view Athabasca Glacier. The last stop is Sunwapta Falls, less than an hour outside Jasper. 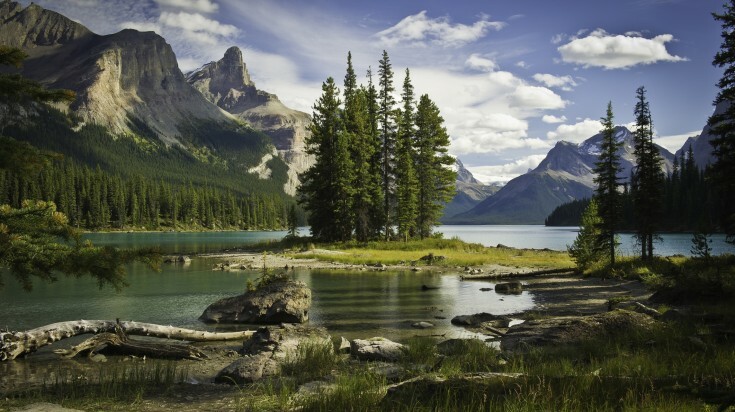 Visit Maligne Lake, which houses Spirit Island, the most photographed island in the world. 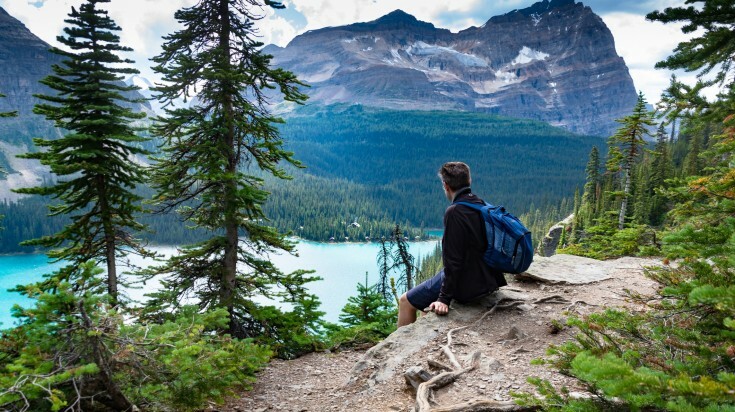 Hike the trails in Maligne Canyon and Mount Edith Cavell or visit Lake Peyto (a less strenuous option). Visit Lake Louise, one of Canada's most stunning glacier lakes. Here you can view wildlife, trek, horseback ride, or canoe across the pristine waters. Sprawling views from Mount Whitehorn. Take the Gondola ride up. Embark on the Lake Agnes Teahouse hike — one of the most popular in the region — before heading back to Calgary. Spending two glorious weeks in the Canadian Rockies means you can take your time and fully appreciate even more stunning places. Follow this two-week guide to squeeze the most out of 14 days in one of Mother Nature's finest natural environments. Note that this road trip starts and finishes in different locations. Explore the charming town of Banff. Walk to the Vermillion Lakes to see the Canadian Geese or along the Bow River. Lake Minnewanka and scenic points along the way like Johnson Lake and Cascade Ponds. 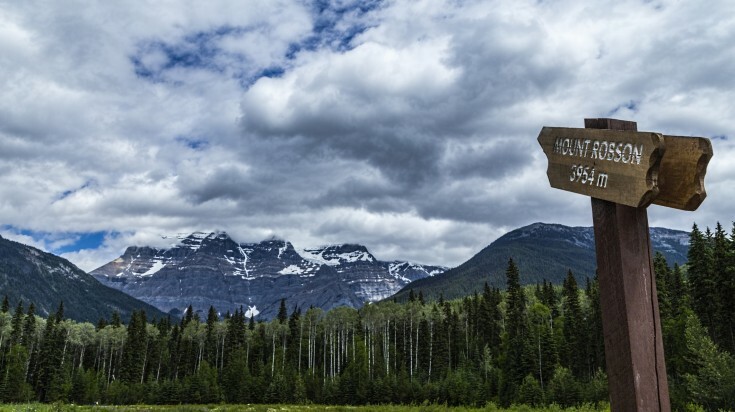 Meander the scenic Bow Valley Parkway and take advantage of multiple "pull-off" viewpoints and hiking in Johnston Canyon. There's also the option for a gondola ride up Sulphur Mountain. Kayaking or rafting in Canoe Meadows on the Kananaskis River. Hike, fish, or canoe in Bow Corridor or visit one of the amazing provincial parks in the area; Peter Lougheed or Spray Valley. The Highwood Pass Loop — one of the best drives in the country. Hike to Bertha Falls and check out Bertha Lake upon arrival at the National Park. Crypt Lake hike, rated by National Geographic as one of the World's 20 Most Thrilling Hikes. Whiteswan Lake Provincial Park for a dip in the hot springs and hiking or a chairlift ride at Fernie Alpine Resort. Soaking in the Radium Hot Springs and hiking to the Burgess Shale fossils or the Stanley Glacier Trail. Kicking Horse Mountain Resort gondola ride with panoramas of the Canadian Rockies, the Columbia River Wetlands, and town of Golden. Take a laid-back walk to the stunning Emerald Lake. Visit Lake O'Hara, a top-notch hiking destination. Explore Lake Oesa, Lake McArthur, and Opabin Plateau. 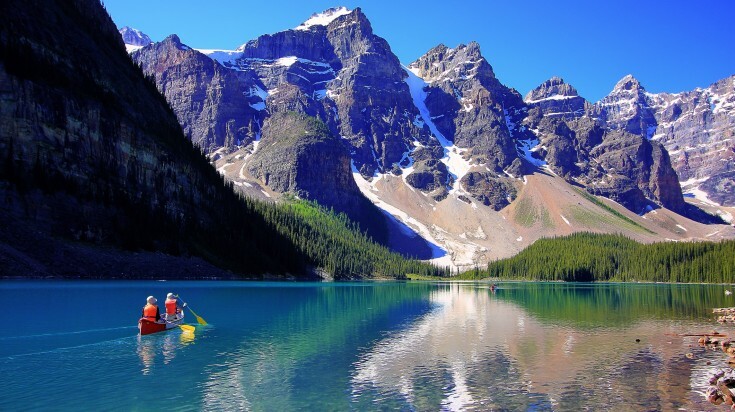 Drive past Lake Louise to first visit Moraine Lake for a serene canoe trip surrounded by forests and mountains. End the day at Lake Louise with a gondola ride or check out the Morant's Curve Viewpoint. Gorgeous views at Peyto Lake and Bow Lake, and glacier exploration at the Columbia Icefield. Maligne Lake and hiking in the Bald Hills around the lake area. The two nearby provincial parks on the way out of Jasper; Mount Edith Cavell and Mount Robson. Stop for the views, pictures, or day hikes. Check out the Canada Olympic Park in Calgary for mini golf, mountain biking, zip lining, skiing, snowboarding, and more. First, there is a standard entrance fee of USD $7.50* per person to enter any one of the five National Parks. If you want to backcountry camp off the beaten track or fish, there are additional permits required that must be reserved in advanced either by phone or online. A fishing permit is USD $7.50 per person per day. The backcountry camping permit is USD $7.50 per person per night and there’s also a one-time reservation fee of USD $9. Camping in the designated campsites requires a daily permit fee of USD $6.70. There are additional fees for the firepit and dump station; both USD $6.70. Good to know: Entrance to the National Parks is free for those 17 years old or younger. If you’re coming from Calgary: The Calgary International Airport is super convenient for those who want to access the Canadian Rockies. It’s just an hour and a half away from Banff National Park by car. From the airport, you can rent a car and drive yourself or hop onto one of the hourly shuttles running from the airport. 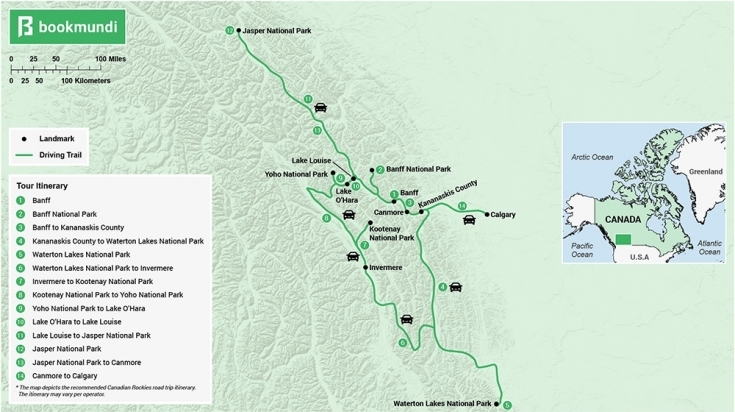 If you’re heading to Jasper National Park, the drive is about 3.5 hours. If you don’t want to rent a car, schedule a bus tour to pick you up or catch a Greyhound. If you’re coming from Vancouver: The drive is much longer. The Vancouver International Airport is over 8 hours from both Jasper and Banff National Parks. Rental car and Greyhound Bus are two of the most viable options to get to the Canadian Rockies. Long underwear – it gets cold at night! There are several options for getting around the Rockies. Car rentals are a great way to have absolute freedom and guide yourself around the region. If you’d rather have someone else in charge, there are guided trips and tours available as well. Public buses are an option, but it’s not recommended. They don’t run frequently and only get you to main locations. From there, you’re on your own. 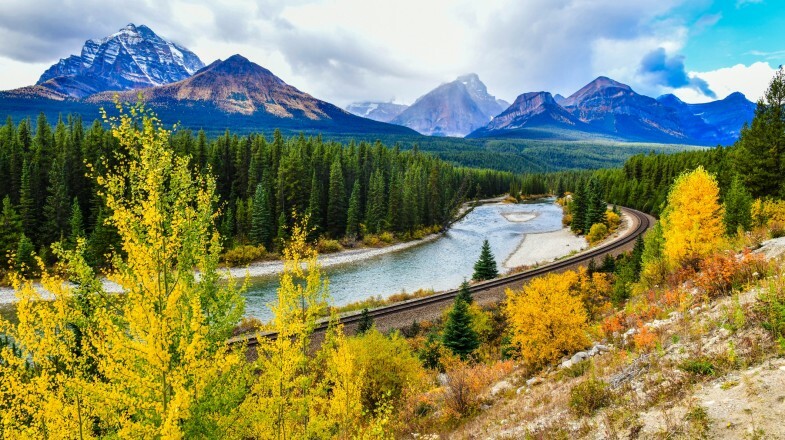 The other option for exploring otherwise inaccessible areas of the Canadian Rockies is with the Rocky Mountaineer train. These trains run to and from Calgary, Vancouver, Seattle, Banff, Jasper, Canmore, Lake Louise, and several other locations. Trips range from 1 day to over 2 weeks, and there are dozens of options to choose from. Be warned, this is a pricey option. Car Rental: The main advantage to renting a car is being able to make your own plan and change or tweak it as much as you want. Stay longer in a destination or leave sooner – you make the calls. Renting a car gives you absolute freedom over your trip. Expect to pay about USD $640 for a mid-range two-week rental. Car rentals come with super basic insurance, but if you want the full insurance (it’s a good idea) it’ll cost an additional USD $160* or so. Guided Trips: The advantages of guided trips are that you don’t have to plan anything, look at a map, or try to figure out what’s the most efficient route. You’ve got a professional doing all this for you. If you want to stress less and prefer a less hands-on holiday, the guided tour option may be for you. Make either Jasper or Banff your base. Some attractions are walkable from either place. For everything else, book tours with one of the many agencies in town. 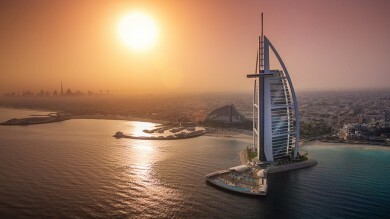 Tour operators offer dozens of different packages to visit the highlights mentioned above. 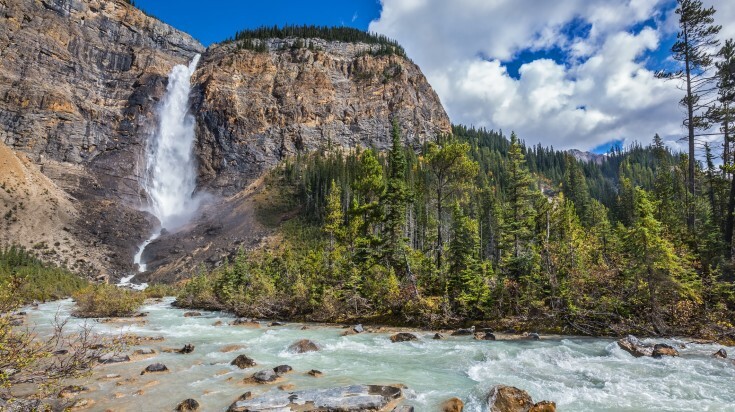 Some general tours you can expect to find are hiking, horseback riding, white water rafting, wildlife spotting, Icefield Parkway tour, Mountain Lakes and Waterfalls, and ATV tours (to name just a few). On average, daily tours can cost anywhere from USD $50 – $200* depending on the activity. The Canadian Rockies are popular, and because of the short “peak” season, accommodations book up quickly. It’s recommended to book well in advance (think 6 – 12 months before your trip). The price depends on which accommodation option you choose. Camp sites can range from USD $12 – $30, mid-range hotels (two and three star) range between USD $150 – $250, and 4 to 5-star hotels often run over USD $500*. Camping is definitely the cheapest option (prices and options as listed above) and favored by those who prefer to stay in the thick of all the nature. Adventure seekers, nature lovers, and outdoor enthusiast, don’t miss your chance to experience Mother Nature’s greatest gift to North America. The Canadian Rockies are a special place reserved for those who appreciate the striking color of a glacier lake, or the way the mountains frame a sunset just right, or the feeling of camping in the remote backcountry. Follow our guide and discover the best of the Rockies.